Today we’d like to introduce you to Robin Jones. Robin, let’s start with your story. We’d love to hear how you got started and how the journey has been so far. Prior to opening Cottontail Quilts (March 2012), I had worked for Transamerica as the Director of Marketing and Training for 16 years. In 2008, I started designing quilt patterns on the side which I sold to a quilt supply distributor as well as consumers online. I was always traveling for my job and found that I was ready to get out of a corporate environment and do something that I really enjoyed. Having a strong marketing background was essential for opening a business in a difficult economic environment. After a great deal of research, I learned that consumers were not buying cars, houses, taking expensive vacations, but they were spending money on their hobbies. I was confident that a quilt shop could be supported in the Kennesaw/Marietta/Acworth area. I put together an extensive Marketing Plan and submitted it to the Small Business Administration in hopes of getting a Small Business loan. I was so confident that my loan would be approved that I started the process of opening a business before everything was “official”. I found the perfect location (a 3,000-square foot home in historic downtown Kennesaw), met with several distributors and started ordering fabric and supplies. My Plan was approved and I was approved for a loan to start my business. My husband, Kevin, was very supportive of my new business venture and agreed to do whatever he could to make things work. We spent four months refurbishing the home to fit the needs of a quilt shop. Everything from refinishing the original hardwood floors to building shelves, we spent many hours at the shop. We opened the shop with two part-time employees (other than myself) and quickly started adding additional staff. Over the past five years, we have substantially grown our business and have more than quadrupled our inventory to meet the needs of our customers. My main goal to be a full-service retail shop selling 100% cotton fabric, books, patterns, notions and more to the sewing and quilting enthusiast. We offer a full range of classes and strive to provide excellent customer service to everyone who walks through our door. We pride ourselves in assisting our customers with everything from fabric selection to the latest quilting techniques. Some of the challenges we overcame included establishing a Point of Sale system, inventory management and maintaining a positive cash flow. 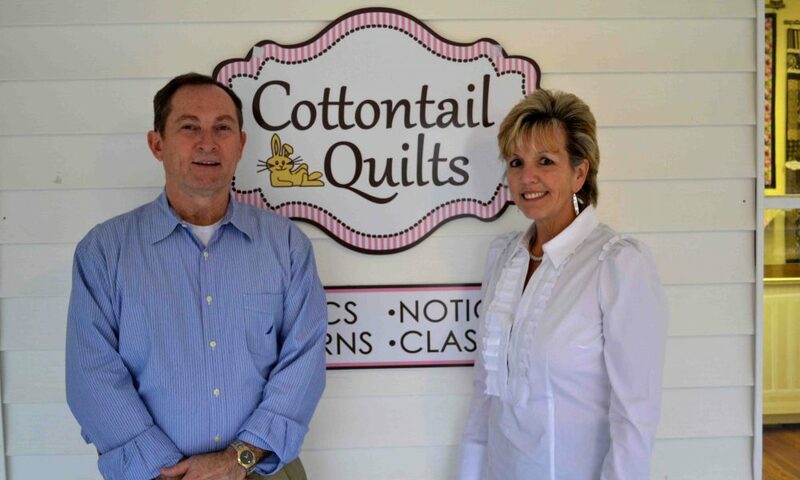 Cottontail Quilts is a full-service retail shop specializing in quilting fabric, supplies and classes. We specialize in one-on-one customer service and pride ourselves in offering the best service possible. Helping our customers create a quilt that they will enjoy for many years to come. The excellent feedback we receive from our customers makes us proud to be a part of their quilting experience. We want to be the “quilt shop they call home.” We want to be the first place they come for their quilting needs. We believe that quilting has become an “art form” which is why quilting has started to attract a younger age group. We have quilters ranging from teenagers to young mothers to men and women who have been quilting for 50-60 years. It’s exciting to see the art of quilting grow to where it is today. I believe that a city the size of Atlanta needs more than one quilt shop. Several shops have closed around Atlanta since we opened five years ago, but it wasn’t necessarily due to poor sales. Most of the shop owners either decided to retire or they moved away. Since there are many different styles of fabric and quilting, it’s beneficial to have enough shops to fulfil the needs of our customers. Quilt shops are considered a destination location which means quilters seek out quilt shops. We get a great deal of customers that are traveling through Atlanta and want to stop by and check out our shop. We are conveniently located 3 miles off Highway 75 a few miles north of Marietta. Downtown Kennesaw is a growing area. With a lot of new business growth, more and more people are moving to Kennesaw. There are many great restaurants and shops Kennesaw’s quaint downtown area. I’ve had the opportunity to visit Cottontail Quilts and was very pleased with the shop. The staff are extra friendly and helpful and they have the best selection of quilting goods that I’ve ever seen. Cottontail Quilts has everything for the quilter regardless of the level of expertise. The staff is knowledgeable, helpful and patient. Robin Jones has instilled the highest form of customer service in this business. It is such a pleasure to shop there! I encourage all interested parties to check it out! Thank you Darlene. Your comments are greatly appreciated. I have known Robin since our mutual “corporate” days…she was my client and from the get go Robin was a step above the rest. I applaud her success…she has a tremendous desire to not only be a success but also to provide a top notch destination for quilting lovers. If I lived within a short distance from her I’d be a “regular”. God bless you all! Congratualtions for a job well done!